I don’t have an NEA Grant, and have never applied for one. I did photograph NEA Chairman Dana Gioia, and have had some subsequent friendly correspondence with him. 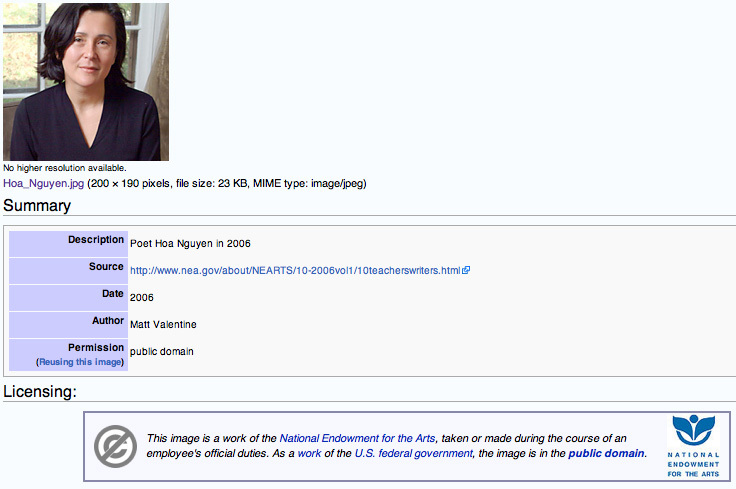 According to Wikipedia, though, I was once in some way employed by the NEA, and some of my photography is therefore federal property, and therefore it’s in the public domain, and therefore it’s free for anybody to use. I had taken a book jacket photo for a writer, and that photo had ended up on an NEA page about that writer. Someone contributing to Wickipedia assumed that I must therefore have been an NEA employee. Way to go Wikipedia. Now, where’s my $25,000 federal grant?